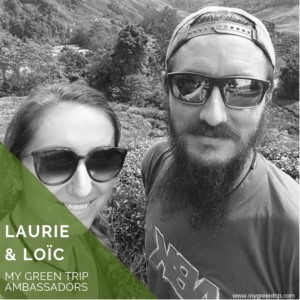 We have been traveling around the world for 9 months and what we are sure of is that tourism plays an important role in preserving the environment. National parks, natural reserves, maintaining historical sites … Unfortunately tourism also has negative aspects when money takes over and everything turns into “tourist attraction” …not to mention the waste production that it entails. We lose the authenticity, the traditions and sometimes even the local currency of a country … For us, sustainable tourism is to make sure that these things don’t happen and that on the contrary it can help to preserve the beauty and richness of each country. We believe in sustainable tourism because it helps to protect and discover in the most beautiful way the inhabitants, the history and the landscapes that compose it. For us it is the only way to travel and preserve all these treasures for the next generations. The cause that concerns us the most is the environment. As a photographer and videographer, nature is surely our favorite subject. We decided to go on a trip around the world to check with our own eyes how is our planet going. Deforestation, pollution, water quality, melting glaciers, waste management, everyone is unanimous. The weather and the seasons as well as the elements are completely disturbed ! So we made the choice to meet in each country a few people who try to change things by choosing sustainable tourism. We had great meetings in Costa Rica, Chile and again in Mexico. We talk about these meetings on our blog and our networks to encourage people to change their way of travel where should I say their vacation mode … Not necessarily looking for comfort and famous attractions but to live the real journey from the inside, the authentic and responsible journey. We will take stock of all these observations and country experiences on our blog at the end of our trip. We want to take action! Waste management in some countries is just non-existent. There is also a great lack of education in many countries where some people seem to have no awareness on the possible consequences of pollution. So one of the things we can do is picking up trash. We also limit our own waste and are careful to say no to all plastic bags etc. Becoming zero waste is good but cleaning up everything that is already in nature is good too! This clean-up kit My Green Trip is exactly what we needed to have a minimum of tools at our disposal. The idea of being able to share these actions and inspire others to do the same is also one of our priorities. The last country we just visited is Indonesia. There we faced a problem. Pick up the rubbish yes … but how will it be disposed of after? We even saw a touristic beach on which staff was paid to bury waste, even though there were bins a little further … It is incomprehensible and just shocking. Beside that, there are local shops that recycle waste into artwork, accessories, or we see messages tagged in the streets saying: make Bali clean again. The hope that things move in the right direction is there and we wonder whether we could help them to become aware of the subject. To meditate !